My name is Paul S., and I have experienced at first hand the suffering and displacement that often result from a neighbourhood’s rapid, unchecked gentrification. My meagre savings ran out in 2013, forcing me to relocate from a lovely, rent-controlled bachelor apartment in Riverdale to a lowest-common-denominator of a flophouse called the Queen’s Hotel, in South Parkdale. It is there that I was introduced to the sorts of stressors which plague the impoverished and the marginalized. From bedbugs, roaches, mice and rats, to major repair issues, to negligent landlords—the Queen’s had it all. And yet I was grateful for a place to live, however sub-standard, as I had come within days of homelessness. Moreover, I discovered a little community at the Queen’s—my fellow tenants had all experienced poverty or mental illness or addiction, and they understood my struggles without needing them to be explained. The Queen’s billed itself as a “hotel,” but in point of fact, it operated as a de facto rooming house, sheltering 20 or 25 of the community’s most vulnerable residents over a period of months and years. There were no short-term guests, no reception desk, no amenities common to even the cheapest motels. In June 2015, when the so-called “BSäR Group of Companies” purchased the Queen’s, my home became a place of instability, fear, intimidation, and uncertainty. Even as company representatives personally assured us that our homes were “safe,” behind the scenes machinations were underway which would ensure the opposite. A campaign of harassment ensued: the hot water was permanently turned off. The bathroom doors were removed, depriving us of privacy and dignity. Dozens of frivolous calls to police were made against several of our more outspoken residents. Same-day evictions were common—including the evening expulsion of a woman whom they knew was facing a spinal cord surgery the following morning. Finally one day, I arrived home to find a notice posted to my door informing us that we were being evicted with six days’ notice. The warning concluded with a promise to toss out any and all personal possessions left behind. Those six days were hellish and chaotic. The company actually went so far as to hire an “enforcer”—in this case, an ex-motorcycle gang thug, whom they paid $500 cash to hang around intimidating us. This company’s contention was that, as a “hotel,” the Inkeepers Act legally afforded them the right to expel us with no forewarning. Well, we fought them, taking them to the Landlord and Tenant Board, charging that the Queen’s was functionally a rooming house, and that the eviction was thereby illegal (it was eventually settled in mediation). This move did not stave off our expulsion, however. On August 7, 2015, I arose to find the biker goon standing outside the front entrance, thick tattooed arms crossed, guarding against any incursions by media, our MPP Cheri DiNovo, or other outsiders (my social worker was prevented from joining me upstairs to help move boxes). We had to be out at precisely 11a.m., and those of us who failed to complete the move by then were prevented from finishing the job, and summarily expelled without any of their personal effects. Several lost everything they owned. Of the 20-odd tenants, three-quarters of us wound up on the street or in the shelter system. I was one of the “lucky” ones—at the eleventh hour, I landed a dreadful room in a squalid rooming house. The woman with the surgery date wound up convalescing in a pup tent. A good friend of mine was assaulted twice in the shelters, resulting in a broken jaw. One tenant, sadly, ended up committing suicide. With bad credit and spotty references, there are still a few of us, 20 months later, who have yet to find stable housing. This is the human toll of unchecked gentrification. It ruins, and costs, lives. It is a cruel and amoral free-market force which wreaks havoc on the lives of the disadvantaged. Sadly, there appears to be very little political will to meaningfully address the issues created by gentrification. In South Parkdale, we’re out here on our own. 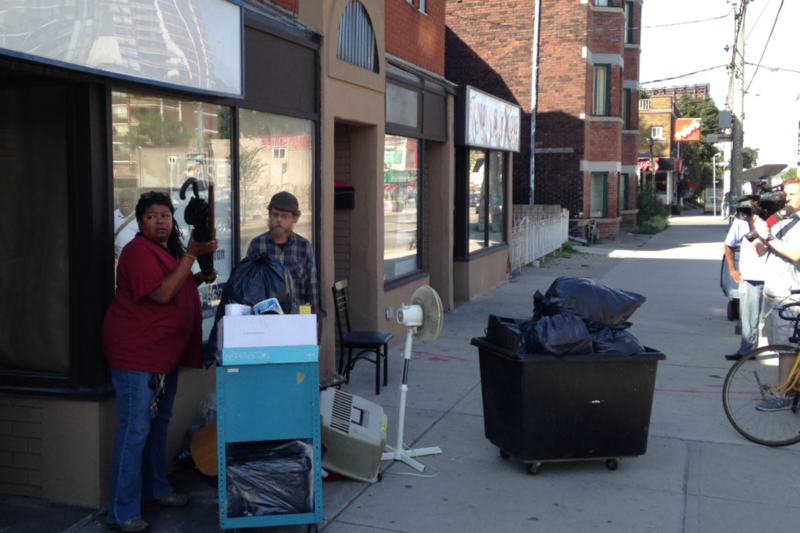 The PNLT, and other such initiatives, are grassroots attempts to keep the area livable for its marginalized population, in lieu of any action from City Hall or Queen’s Park. It’s not enough. We need leaders who will be proactive and consistent in protecting the city’s vulnerable citizens, who will put their endless rhetoric into action. Truth be told, I’m not holding my breath. I’ve been on both sides of the tracks now, and it’s been an eyeopener. The way in which society neglects and ignores the poor has got to change. We are human beings, and we aren’t all the authors of our own misfortunes. I may have made a few mistakes to get here, but I am now mired in a system which is rigged to see me fail.